Infiniti has made public an imagine that shows one of their most awaited for models. We refer to the Q60 concept that has been shown by the car makers in a photograph. The car will be launched on January 13 in Detroit at NAIAS. We remind you that to promote the car Inifinity has also shown a teaser of the new model a few weeks ago. Curious to know where the roofline and the aerodynamic gills located behind the front wheel arches that stand out come from? The answer is simple. 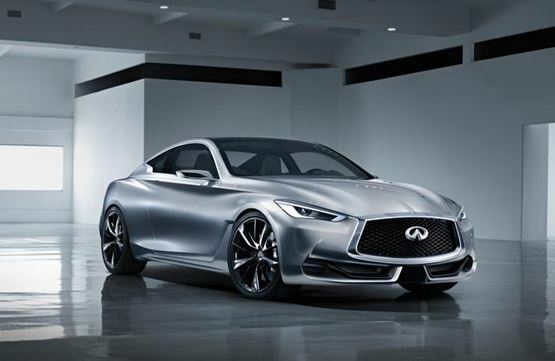 As you may have noticed the Q60 concept is inspired by the Q80 Inspiration concept and the Q50 Eau Rouge concept. Impress arsenal for the the Q60 concept promises to make future drivers very satisfied. List counts masive 21-inch alloy wheels and black spokes with matte & chrome accents. The interior promises to complete the picture for the perfect car. As far as information provided by the producers shows the Q60 concept combines inspiration from the cars mentioned above taking only the best. Among the elements we count quilted leather seats that will be hand-stitched and added carbon fiber accents. Also it’s important to mention that legroom has been boosted via the 2+2 cabin. This entry was posted in Concept Cars, Infiniti and tagged infiniti, Infiniti Q60 concept, Q60 concept, Shown. Bookmark the permalink.